The Frosty™ Dairy Dessert at Wendy’s is now available in vanilla. I know what you’re thinking: <Gasp!> It can’t be true! The Frosty only comes in chocolate! It’s always been chocolate! You may think I’m exaggerating slightly, but when I broke the news to my friends, that was exactly the reaction I got. One friend refused to believe it was true until we went to a Wendy’s and actually purchased one. The first time I saw evidence of the new vanilla Frosty, I was in shock too. The Frosty is legendary! It’s almost unbelievable. And that’s not all… Not only can you get a vanilla flavoured Frosty, there are two brand new Frosty products on the menu. 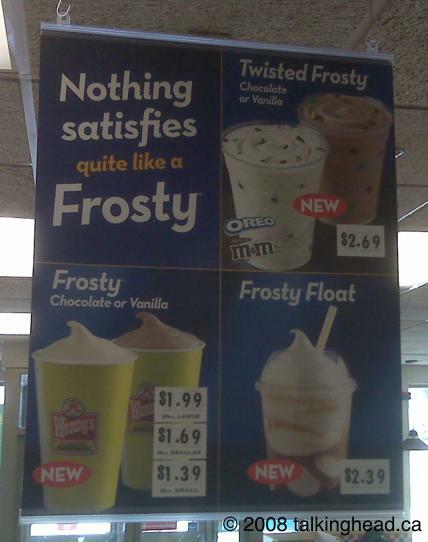 Twisted Frosty is Wendy’s version of a McFlurry, which was McDonald’s cheap ripoff of a Dairy Queen Blizzard. You have the option of adding Oreo bits or crushed M&Ms. Wow, that’s original. The other new option is the Frosty Float. P.S. Don’t look up the nutrition facts. You’d rather not know. This entry was posted on Saturday, May 3rd, 2008 at 22:38 -0500 and is filed under Uncategorized. You can follow any responses to this entry through the RSS 2.0 feed. You can leave a response, or trackback from your own site.